"Ron and Leetal's goal to introduce New Yorkers to “real” homemade Harissa, Tanzeya, L’ekama and other traditional Jewish Sephardic culinary traditions is an architectural passion-project in the tasting." We are an artisanal food company focusing on Sephardic and Middle Eastern Jewish cuisines. Our goal is to blend our multicultural backgrounds and culinary expertise to create your Middle Eastern pantry staples. Join our journey in keeping culinary traditions alive. Wondering what to cook with harissa, l’ekama and tanzeya? Wonder no more! We put together our favorite recipes to inspire you to get in the kitchen and create memorable meals for you and your family. From a roasted eggplant salad to a slow cooked short rib and Harissa stew. 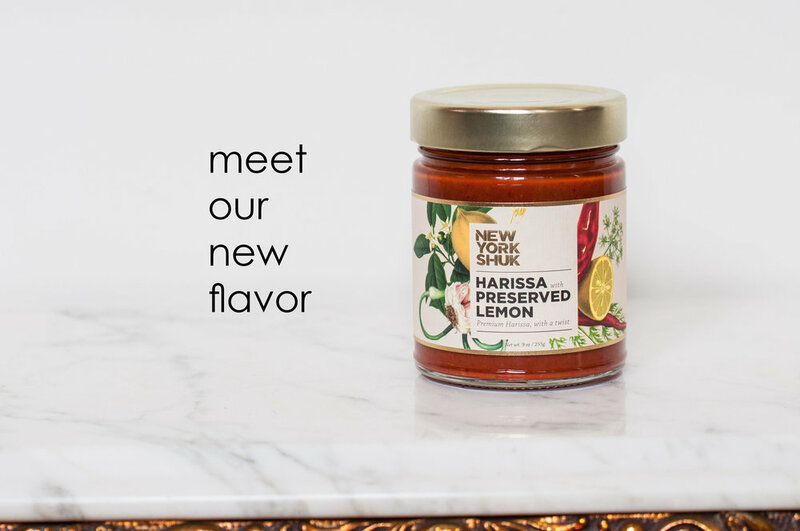 Our line of handcrafted pantry staples include harissa, a dried fig and apricot spread called tanzeya, and l’ekama, a garlic and chili oil infused with Middle Eastern spices. This is our way to give YOU the tools to create these authentic flavors in your own home. The journal is where we share with you our secret family recipes (poppy seed cake anyone? ), Our various collaborations with NY based artists, limited edition products & promotions and our journey to bring lesser-known Jewish foods into the limelight. We'd love to hear from you. If you have any questions, comments or reviews of our product, please let us know! If you are a buyer/shop owner/chef looking to carry our products email us: info@nyshuk.com and lets see how we can make it happen. We believe in the story that is archived for future generations. We believe it is time to dust off your family recipes and bring them back into your life. Share with us your special family recipe, your memories and together we can preserve a piece of our culinary heritage.